What do people say about my teaching? "It's wonderful to have an instructor who cares so much about his students, his art and the art of teaching. Thanks for everything." "I have to say, having sat through many lessons over the past few years, you have an amazing way with the students." "Thank you for you professionalism and individual approach you give to both our children!" 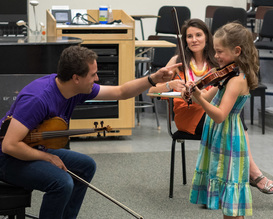 "I love that the discipline [of violin lessons] carries into my daughter's life! Thanks for what you do." "Your commitment and dedication to my daughter is what we appreciate and hold in our hearts. Thank you for the amazing teacher and person you are." "Watching a group class with you is a joy because of your expertise as a teacher. You skillfully engage the students with games and humor, along with kindness and respect, in a way that every teacher should emulate." "Great balance of work and fun/sense of humor that the kids sure appreciate! Thanks for sharing your gift." "We love having you as our teacher ... I appreciate the calm you add and your knowledge of teaching children (and novice adults like me), not just your musical ability." "We cherish every minute spent learning from you." "Your patience, kindness and sense of humor really inspired my daughter. And you helped to improve her sound dramatically in the past year!" "You are part teacher of violin, part psychologist (for both parent & child) and part cheer leader. ​We are honored to be in your studio."